Not only will Splash Guards help protect the side of your vehicle from rock chips, they help keep it clean from mud and tar. 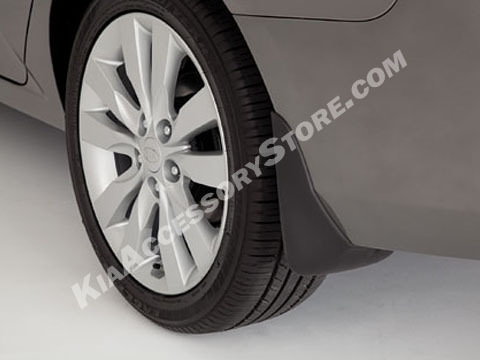 This is one of the least expensive ways to keep your Forte looking great with our custom fitted Splash Guards. Made of ultra-durable molded black plastic. The order arrived on time and in good condition. Installation was a snap. The front guards are easier to install than the rear guards. For the front, you will need to turn the wheels several times to gain access to the screws. In the rear, you can either remove the wheels or use an offset screwdriver or a ratchet with a #2 Phillips attachment. The fit was perfect, the quality is excellent, and I think it adds a little something extra to the appearance of the car. These guards should help keep splashing on the doors and quarter panels to a minimum, and will also keep down misting which should help the drivers behind the car see better.